We are all wearing costumes. According to the Merriam-Webster dictionary a costume is "an outfit worn to create the appearance characteristic of a particular period, person, place, or thing". Now take a look at this verse from John 3:6, "That which is born of the flesh is flesh, and that which is born of the Spirit is spirit". If you have accepted Christ, you are no longer flesh, but spirit. Hebrews 13:14 reminds us that this is not our home. So follow me here. 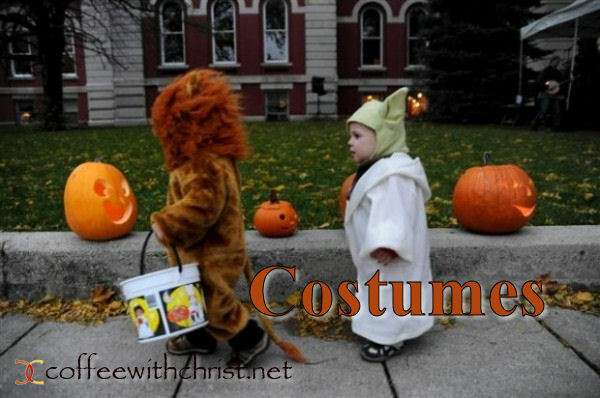 We who are saved by grace are wearing a costume and wandering the neighborhood until we go home. That leaves us with a myriad of costume choices. Fortunately, God has some suggestions for us. Ephesians 4:22-24 encourages us to shed our old costume and instead put on a new one. One that is in the likeness of God. Ephesians 6:10-18 reminds us that while we are here in this world we aren't safe and as a result we need to put on our armor to protect and defend ourselves. Colossians 3:12-15 gives us a list of things to put on as well: compassion, kindness, humility, meekness, patience, forgiveness and love. And the suggestions don't stop here. God's word is full of advice about how we should navigate this world, if we just take the time to read it. Instead we tend to be so focused on gathering the treats and avoiding the tricks that we neglect the instructions our Father has given us before He sent us out. This Halloween I encourage you to take some time to consult with Him. Trust me in that the costume He would have you to wear really is flame retardant! And it brings me back to my stepmom. She loved my dad, and understood that I was a package deal with him. And yet, she chose to stay, and love us both. (There were women prior to her that couldn’t accept me with the deal. (And this was before I was a mouthy, selfish, unappreciative teenager!)) She took the verbal attacks, the silent treatments, the acting out; she took it all in love for me. And that brings me back to our Father. He does the same doesn’t He? I know I’ve lashed out at him in anger and hurt. I know I’ve ignored Him and His teachings at times, because I thought I knew better (or at the very least just didn’t want to do what He wanted). 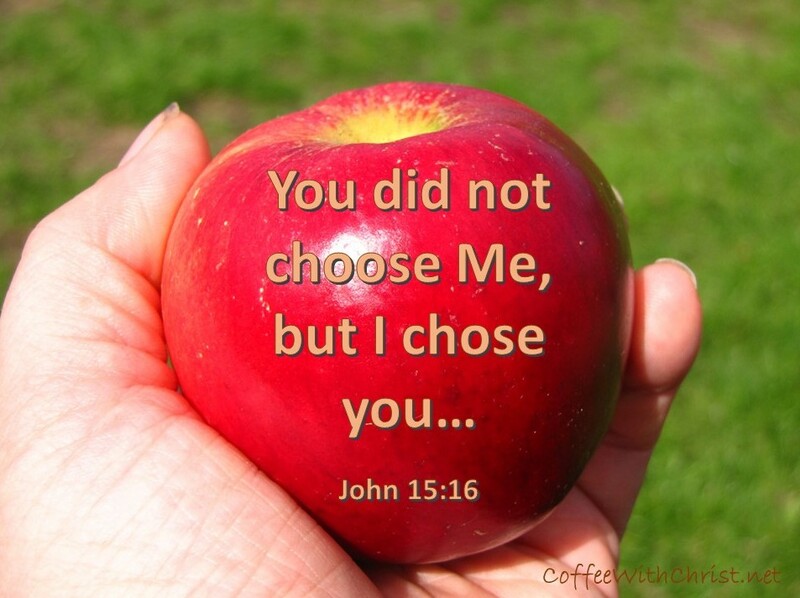 I know I did some things that clearly were against His Word… And there have been times when I didn’t want Him ‘around’… and yet He has taken it all in love for me. As a matter of fact; He’s gone above that, and sent His Son to die for my [all of the above]. As I grew up, I finally began to fully appreciate the value in having my stepmom. Yes, I have my mom, and my stepmom could never replace her, but she has a whole other role in my life that my mom can’t fulfill. Especially as I’ve gotten older, my stepmom could’ve backed away, eased out of my life (as we live 400+ miles apart), but she hasn’t; we’ve actually grown closer. I’ve had some painful losses and disappointments in my adulthood; she’s cried with me. I’ve had aspirations and dreams; she’s prayed for me. She’s been a huge supporter and encourager of my life. My own personal cheerleader, so to speak. Not that my mom couldn’t or wouldn’t do those things; it’s just… my mom has to love me; she naturally aches when I hurt, prays for me, and wishes the best for my life. My stepmom chooses to do these things. (And she has two daughters of her own, and still chooses me (as the favorite) (LOL)).